Warehouse design and operations have undergone major changes over the past decades. In particular, with the onset of e-commerce, the complexity of warehouse operations has increased multi-fold with the storage of large SKU assortment in small quantities, volatile demand patterns and primarily single-line customer orders. They have grown in size due to consolidation, new and fast identification and communication technologies have found their way into the warehouse and process automation technologies have progressed improving speed and operational efficiencies. 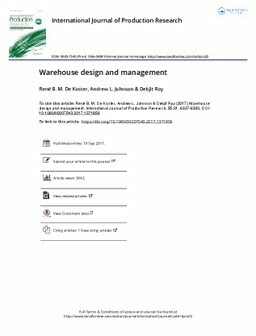 In line with these developments, this special issue pays attention to new technologies and methods and how they impact warehouse design and management.